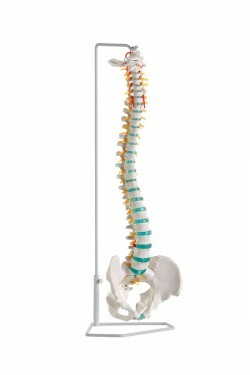 Prezentowany produkt to realistyczny model anatomiczny 3D. 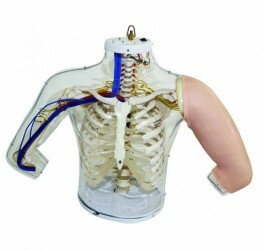 Dzięki wykorzystaniu danych obrazowych CT oraz technologii druku 3D przedstawia szczegółowo większość detali anatomicznych. 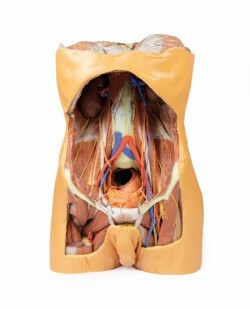 Trójwymiarowe modele anatomiczne skonstruowane w taki sposób, stanowią znakomitą pomoc dydaktyczną dla studentów kierunków medycznych zapewniającą bezpieczeństo i higienę pracy. 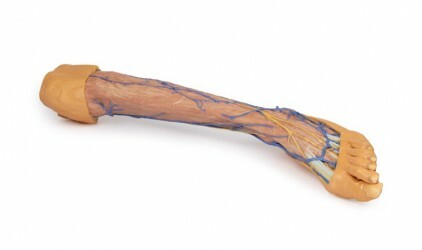 This 3D print demonstrates a superficial dissection of a left upper limb from the blade of the scapula to the hand. 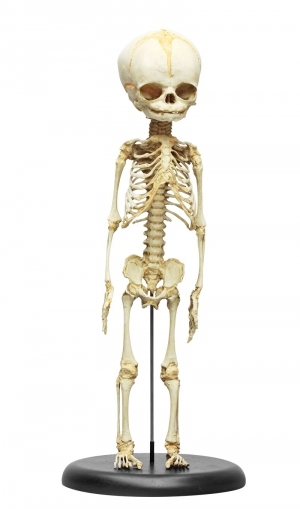 The skin, superficial and deep fascia has been removed from most of the limb except over the dorsum of the scapula, proximal arm, and over the hand. The median cubital vein, cephalic and basilic veins are preserved, with the latter two preserve from the wrist to their terminations (in the deltopectoral groove and brachial vein, respectively). In the axilla, cross-sections of the deltoid, supraspinatus, infraspinatus, teres minor, teres major, and subscapularis muscles are visible relative to the bony blade and spine of the scapula. The coracobrachialis and tendon of the latissimus dorsi are also preserved, as well as the tendon of the pectoralis major. The lateral portions of the axillary artery and vein and the most lateral extend of the cords of the brachial plexus (medial, lateral, posterior)are also present. 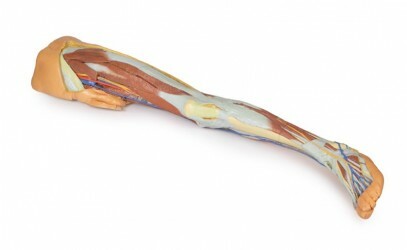 Terminal nerves of the brachial plexus visible in the axilla of this specimen include the upper subscapular, ulnar, median, musculocutaneous, axillary and radial. 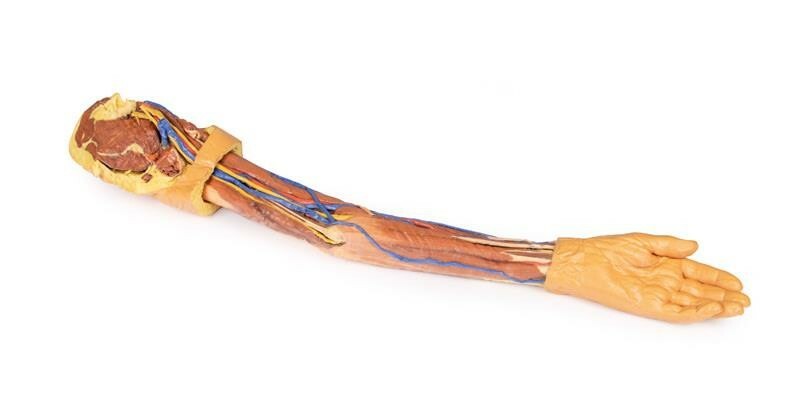 The course of the deep vessels and nerves of the upper limb is exposed through the arm from proximal to distal, as well as the muscles of the anterior and posterior compartments. 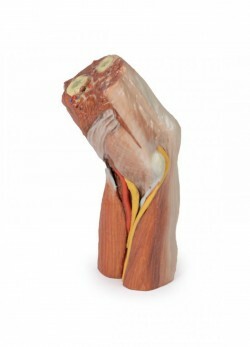 In the cubital region part of the bicipital aponeurosis is preserved. 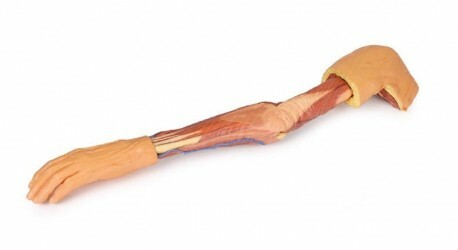 The superficial layer of anterior and posterior forearm muscles are exposed from their origin to their tendons distally, with a small portion of deep forearm fascia over the extensor compartment maintained for reference. 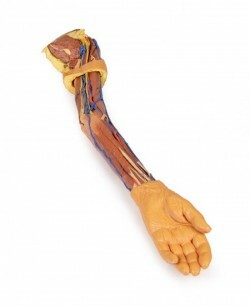 At the most distal extent of the dissected forearm, the ulnar and radial arteries and median nerve are visible.